Jan. 30, 2014 4:00 p.m.
Leduc County Mayor John Whaley (on left) and Leduc City Mayor Greg Krischke (on right) both focused on Intermunicipal cooperation during their speeches at the January Leduc Regional Chamber of Commerce Luncheon. The January Leduc Regional Chamber Luncheon was once again a sold out affair with everyone eager to hear the "state of the union" addresses from both Leduc City Mayor Greg Krischke and Leduc County Mayor John Whaley. 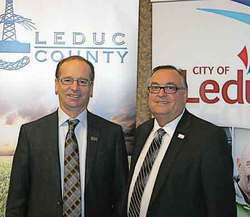 Mayor Krischke was the first to take over the podium with the introduction of Leduc's new corporate video. The video, professionally produced and highlighting the best that Leduc has to offer, was designed to attract new residents and businesses to the City. After the excellent reception the video received from the audience Mayor Krischke affirmed that "People are our greatest resource. ", and then proceeded to share some recent statistics that showed how tools such as the promotional video have affected the City of Leduc. He stated that in 2013 Leduc's population increased another 6.9%, or 1,800 residents, and that we had the second highest year ever for commercial/industrial construction permits. As an example of our rapid growth Mayor Krischke shared that amazingly, for a city of just under 28,000 people, over the last five years the City of Leduc has seen over one billion dollars in building and industrial permit revenues. He said that the quality of life in Leduc is what attracts people and while we need to look out for today, we also need to keep and eye out for tomorrow. One of the examples he cited was the C-Line bus service which is a joint initiative with the County of Leduc, and which has seen another increase in ridership of 29% over this last year. One of the focuses of Mayor Krischke's presentation was bringing to light the many different ways the City of Leduc partners with the County, averring that the City and County are "closely aligned". A number of new projects are in the works with the Mayor excited to speak about three major infrastructure projects getting underway this year. The new west end fire hall, the library expansion and the City's new splash park will all break ground this year and completion of all three projects is projected for the summer of 2015. The final subject Mayor Krischke mentioned was to touch on the annexation between the County and the City of Edmonton. He reiterated that the City has a close working relationship with the County and that the City supports the County in that any annexation must maintain the viability of Leduc County. However, he also stated that he supports the ability of Edmonton to grow but that a contested annexation is costly and does not benefit anyone. In closing, Mayor Krischke said that Leduc has a quality of life that continues to attract and retain residents and that he was proud to be our Mayor. As Mayor Krischke retook his seat to a loud round of applause, Leduc County Mayor John Whaley was welcomed onto the podium. Mayor Whaley immediately got a chuckle from the audience as he thanked Mayor Krischke for the show of support for the region and then commented that the luncheon today was going to be a bit of a "love fest" between the City and County. "But in a good way! Oh, I think that comment is going to come back to bite me." he said with a smile. He then drew an even larger laugh when he commented on the attendance of an Edmonton City Councillor by joking, "And what can I say about Edmonton Councillor Mike Nickel keeping tabs on what I'm going to say here?" Mayor Whaley began his speech by also touching on the joint C-Line initiative stating that with 52,827 riders in 2013 he felt that this service was brought in at the right time for the region. He then raised the very real concern of the 190 bridges within the county that are all over 50 years old and which will all be needing repairs and upgrades in the very near future to keep them safe and viable. "We need to figure out how to find the money to fix them with no more Provincial dollars coming in for those repairs. I just thought I would mention that seeing as there are Provincial representatives in the room." commented Mayor Whaley in a teasing manner, referring to the presence of Minister Diana McQueen. He briefly touched on the very successful 50th Anniversary celebrations that took place for Leduc County in 2013 and then moved on to pay tribute to all the farmers in the area and to salute them for the job that they do. It was pointed out that another way that the County partners with local municipalities is through the County's recreation infrastructure and services cost sharing agreements. In 2013 the County gave out over $2 million to communities such as Thorsby, Warburg, Calmar and New Sarepta for facilities and programming. 2013 also saw Leduc County bring in $52 million in new residential construction and $102 million in commercial/industrial construction. Then Mayor Whaley began to speak on the topic everyone was waiting for. He said, "Everyone wants to hear about the "A" word. Annexation. We have a number of them on the books with Devon, Beaumont and Edmonton putting forward proposals. Calmar and Thorsby are looking to grow as well, and we just successfully completed one with the City of Leduc. It is a big region and we work together." Commenting directly on the Edmonton proposal Mayor Whaley did not mince words as he stated "If Edmonton goes ahead as proposed it would set the County years behind in infrastructure and growth abilities. We can't afford to squander our #1 farm lands which would be lost in the Edmonton annexation." Moving on to the Beaumont annexation Mayor Whaley surprised the crowd by announcing that he feels the two parties are pretty close to a "deal" they could publicly roll out to residents, possibly within the next month. With the recently announced Devon Annexation proposal for 600 acres of County land on the south end of the town, Mayor Whaley shared that the Town and County are currently in discussions, with the intent to move forward with a cost sharing agreement for the land. Mayor Whaley received a round of applause as he stated that "The County is not against annexation because people have to grow. I just hate having to spend taxpayers dollars on lawyers for it. Let's just get together and do it!" He finished up his presentation with what he called a "good news story" in that the CRB had recently approved the Area Structure Plan for New Sarepta and that they would also be celebrating the grand opening of their newly expanded Agri-Plex this June. Other exciting planned projects showing the growth around the County are the Royal Oaks subdivision at the north end of the East Vistas, which will be fully urbanized country estate lots, the recently announced commercial expansion at the Edmonton International Airport, and the two gas fired generators that should be completed and running by 2017 at the Genesee Power Plant. One of the last statements shown on the County's Power Point presentation was the perfect closing remark in that it said "The future is uncertain but we remain optimistic." The next Chamber luncheon will be held on February 7th at the Nisku Recreation Centre with MP James Rajotte giving an "Update From Ottawa". For tickets please contact the Leduc Regional Chamber of Commerce at 780-986-5454.